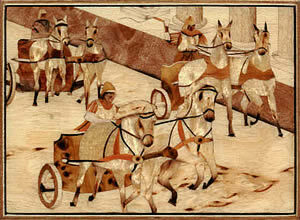 These Cutter Interviews have introduced you to some very prominent members of the Marquetry Society. You have met, among others, a President and a Chairman of the Society, a former editor of the Marquetarian, the longest serving member of the Society, and a goodly sprinkling of Rosebowl winners. 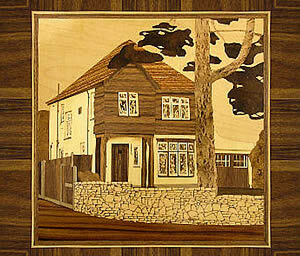 All those people you have met so far, hold a special significance in the structure of the Marquetry Society. 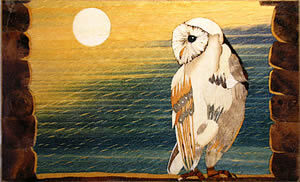 It would certainly be true to say that without their presence and contributions, the Marquetry Society would never have become the recognised authority it is today in its role as leading ambassador for the art and craft of the global Marquetry movement. Our Interviewee today is one of the most tireless practitioners we have ever met of this ancient and noble marquetry art of ours. He applies himself to the furtherance of our cause with a fervor few could match. 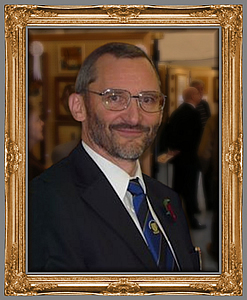 Our rather distinguished looking "victim" for this particular Cutter Interview is a marquetarian who has won multiple awards in his own right, and whose group recently achieved the Group Shield in the 2008 National Exhibition. Yes, it is indeed the Staffordshire Group's secretary and founder Quentin Smith who has allowed himself to be put under the spotlight for our latest interview. Cutter: Hi Quentin, welcome to the Cutter Interview. 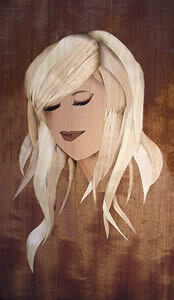 Now, how did you first get into marquetry? 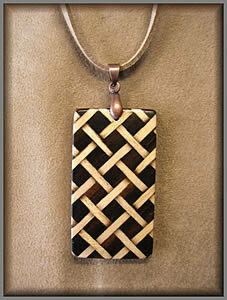 Quentin: My father made a few items in the early 1960s, so I was aware of it from an early age. My wife and I came across a display by Art Veneers in a department store in the mid-1980s and I must have shown some interest, as she went back and bought me a kit for Christmas. We were living in Essex at the time and luckily the Thurrock Group started up nearby, so I joined them and then the Society. 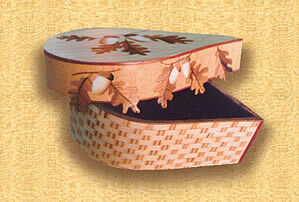 Cutter: What is your trade or profession and does it help your marquetry? Quentin: I’m a microbiologist by training. Microbiologists are usually pretty dextrous as your aseptic technique needs to be precise – you don’t want to spread Salmonella all over the bench! I still use the scalpel, forceps and scissors from my university dissecting kit. Cutter: What was the particular attraction of marquetry? Quentin: I suppose it’s the precision, coupled with the beautiful results you can achieve. I’d always been quite good at detailed hobbies, Airfix and railway modelling, but was (and still am) pretty hopeless with “proper” woodwork, so this was a way to work with wood that suited me. Cutter: Did you ever feel that you had been inspired by anyone else’s work you had seen, perhaps at a National Exhibition or a local competition? Quentin: Only my father’s at first, until I visited my first “National” in 1988. I walked in the door and was faced with Alan Townsend’s “Siberian Reflection”, which had won the Rosebowl the previous year. I still think that’s one of his best. There were some great pictures that year – Peter White won the Rosebowl with “Tawny at the Wheel”, Alan’s “Flapper Girl” and “Cornfield Scenario” both took awards, as did Eddie Stevens’s “HRH Queen Mother” and Horrie Pedder’s “Cutty Sark”. I realised there was a bit more to this marquetry lark than I’d managed thus far! Cutter: What sort of designs attract your attention? Quentin: I don’t think there is a particular sort of design, you just see something and it grabs you. Some people reckon that attractive women seem to crop up quite often in my work! Cutter: Do you keep all your creations? Quentin: At first I kept almost everything, with just a few items made as gifts. Now that I’ve gone commercial I have to accept that I’m making things that I have to part with, but that doesn’t diminish the pleasure you get from a piece that turns out really well. The collie “Flip” was one of my first commissions and I rate it amongst the best things I’ve made. Cutter: Which item, from all your work, has given you most satisfaction? Quentin: It would have to be “Charge of the Light Brigade”. I’d started picking up awards in miniatures, but was always finishing behind Ron Gibbons. I used to tease him that “next year I’m going to do Charge of the Light Brigade”, but I don’t think he thought I was serious. After Ron’s untimely death I felt I really had to get out the design, which I’d had from some time, and give it a go. Everything I tried on that picture just seemed to work out right and I was very proud to be the first recipient of the Ron Gibbons Trophy. Cutter: Where do you get your designs? Quentin: In the past, it has been anywhere and everywhere. I expect most readers have a box of magazine cuttings, Christmas cards and the like that they have amassed and I’m no different. However in the last year or so I have tried to do only original work from my own or clients’ photographs. Cutter: So do you work from a colour or black and white print? Quentin: I usually keep a colour print for reference, but use a black and white version as the working “drawing”. I find that helps to show the tonal separation between key elements of the picture. 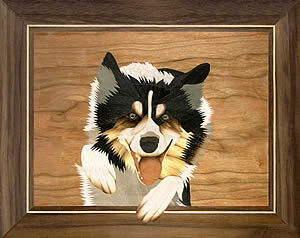 Cutter: You mentioned that you are now doing marquetry commercially, has that changed your way of working? Quentin: I’ve had to find ways to achieve a satisfactory result quickly without compromising quality. 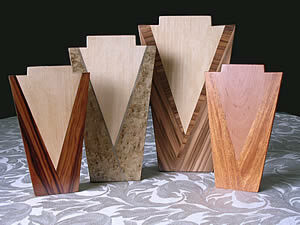 Veneer choice is key as “letting the veneer do the work” is more important than ever. You also don’t want to be re-cutting pieces, so I seem to be using more tape to keep everything together while it’s in progress. I also use (shock horror) an orbital sander during finishing. Cutter: The ‘for or against coloured wood’ argument has gone on for years. What are your views on it? Quentin: I have no problem with the use of coloured veneers and quite a few of my pieces use them – lots if you include black. The colours need to complement the picture, and each other. 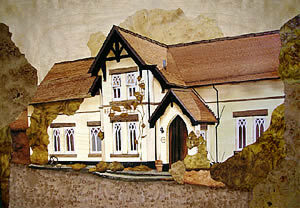 For good examples look at the way Brian Freeman uses coloured veneers in his miniatures. Unless a lot more colour shades become available blue sky and green grass are not going to work in marquetry. Cutter: I’m sure that you have seen this question come up many times before, but what is your stance about the long-standing debate of marquetry being an art or a craft? Quentin: That’s easy – it’s both! 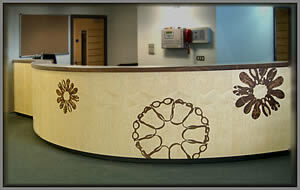 There’s no question that making a pleasing design, with balanced use of colour and figure of the veneer is art. Joining the bits up with no gaps is craft. 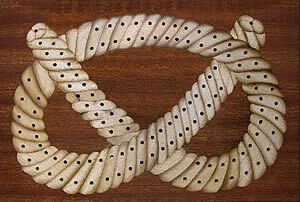 In any art, painting for example, there is a series of craft techniques that must be learnt, and copying other work is a good way to do that. To be an artist though you need to be expressing your own ideas, not merely copying others. I’d love to see more original work in our exhibitions, but we seem to have more craftsmen than artists. Cutter: What’s your view on the competitive side of our Exhibitions? Quentin: I think the element of progression through the classes has helped to maintain the overall standard and I am sure it has developed the skills of the individuals. I expect many members have tackled a more difficult picture than they might otherwise knowing that they have moved up a class and are now “up with the big boys”. That said, there is an element of luck involved in our competitions, as your award for a particular picture depends on what else has been entered that year. We could try a merit based award system like that used by the RHS at the Chelsea Flower Show – but would you want to be one of the judges who doesn’t award any “golds” in a class? Cutter: Would you like to see ‘Judges comments’ reintroduced for the National award winners? Quentin: That’s tricky! Constructive comments can help both the author of the work, and other readers, improve their work. However much of our members’ work is of such a high standard that criticism starts to centre around personal preference. In the Staffordshire Group we encourage discussion of work whilst it’s in progress – it’s better to say “I don’t think that piece is really working” when it’s just gone in, than when more detail has been added and it can’t easily be changed. I can remember several discussions with John Jeggo when “One Spirit” was under construction. When he won the Rosebowl I think we all felt we’d contributed a tiny part! 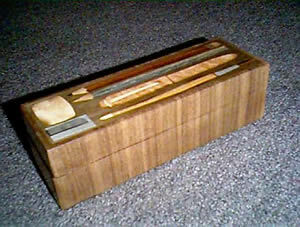 Cutter: Has there been any piece of work, made by any other member, which has left you thinking I wish I had done that? 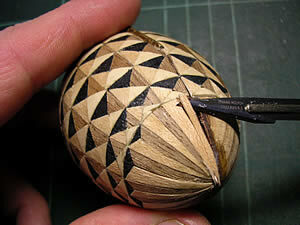 Cutter: Do you think that there is any case for introducing any other media into marquetry, for example pyrography? Quentin: It could be interesting to allow entries in class 10 (exhibition only) to be eligible for the Artistic Merit award. They would avoid judging by the marquetarians, but would be considered by the outside artist. 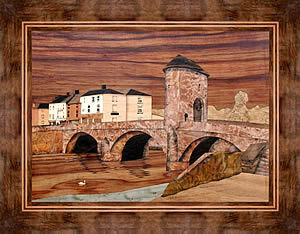 One of our Staffordshire members, Jack Webb, often uses marquetry, pyrography and even carving in the same picture to great effect. We could also consider straw marquetry – there are some expert practitioners in this country and they are very adept at using the colour and grain of their material. 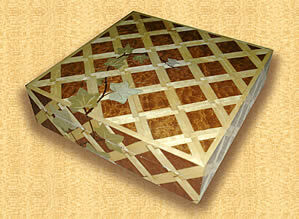 Cutter: Texture, even decoupage and 3D effects are also being introduced in some areas of marquetry. 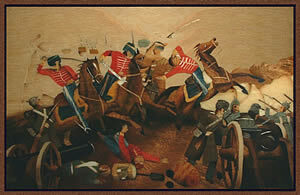 Do you think the Marquetry Society should now consider these as legitimate techniques? Quentin: Yes I do, and while it’s tempting to suggest having a new “arty” class I think that would just allow these innovations to be sidelined. I’d like to see more works like Susana Bartolomé’s 3D wall art. Perhaps a new award for innovation is the way forward? Cutter: You operate a successful web site for the Staffordshire group. 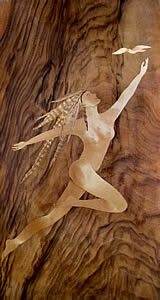 Do you think that exposure on the web helps very much in promoting the art of marquetry to a new audience? Quentin: The internet is the first place many people look for information on a subject, so it is vital that the Society, and individual groups if possible, have a web presence. However, these visitors are people who are already aware of (and can spell) marquetry. To reach a “new audience” I don’t think you can beat getting examples of our work into shows and exhibitions wherever possible. Cutter: Do you have any other crafts, hobbies or interests that share your available time? Quentin: I play bowls in the Summer and occasionally inflict my guitar playing on the local folk club. Cutter: Thank you for talking to us Quentin.